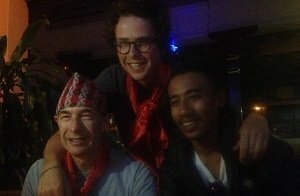 Tom Langan is a born adventurer and guides for Lost Earth Adventures in Nepal and in the UK. 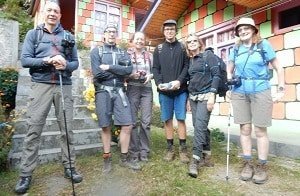 This is his trip report for our most recent October 2016 Annapurna Hike and Bike tour. 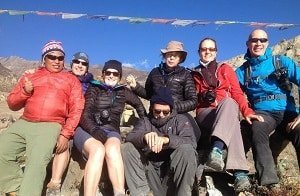 I was recently lucky enough to lead a diverse, fun and adventurous group around the Annapurna Circuit. 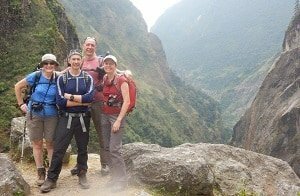 This is often cited as one of the world’s best treks. We’ve added a twist to this classic route, by mountain biking down the western side. The route crosses several different climate zones, and takes in the Thorung La Pass at 5400 metres. Our group adapt to the challenges, trekking at altitude and mountain biking downhill over rough and changing terrain. 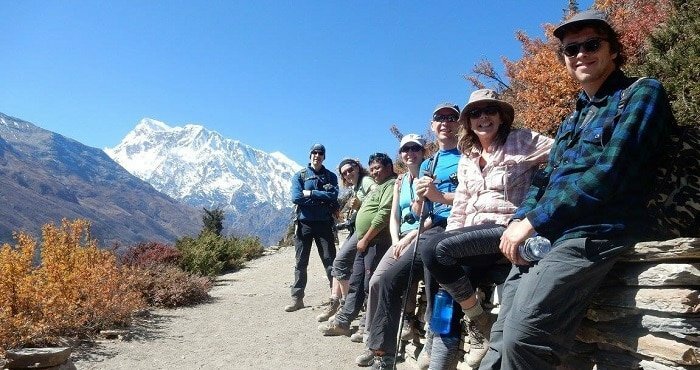 But the rewards and the accomplishments are high, and the outstanding views breath-taking as we journey around the Annapurna Massif and deep into the Himalaya. 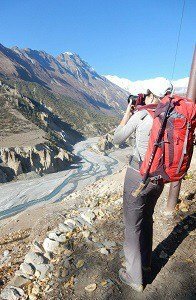 Our Annapurna trek starts from Jagat, but the ride there from Kathmandu is incredibly scenic, following steep valleys and large, flowing rivers. As we get close, we change to a 4×4 jeep and head off-road. Our driver is skilled and calm, effortlessly taking our group along the rocky trail into the night. By the time we arrive at our destination, the feeling of being remote and away from the hustle and bustle is strong and we look forward to the trail ahead. Our intrepid and eager group headed out the following morning, quickly exposed to stunning views of tall waterfalls running into the valley. After the first suspension bridge the trail climbs up the valley above the Marsyangdi Nadi River. The forest is subtropical and the air humid. One final climb brings us through a gate marking that we are passing into the Manang District, and to Tal, a village set on the eastern bank of the river. Tal (Nepali for lake) sits on what once used to be a lake, in a wider and flatter part of the valley, but still with high imposing walls and cascading waterfalls. After a lunch stop, the trail continues beside the river. Steps and passages are carved out into the rock walls as we walk through a canyon. It’s a beautiful walk, crossing back and forth over the river by way of suspension bridges. Our day concluded in Dharapani, a village by a valley junction (the valley to the east leads to the Larkya Pass and Manaslu). Each guest house has an extensive food selection, and most share similar menus so it becomes easy to plan what you will eat at the next meal. Western foods such as pizza, chilly chips, omelettes and pasta are popular, as well as Nepali and Indian curries. One meal in particular is a staple for locals, dal bhat. This consists of steamed rice, curried vegetables, lentil soup, spicy pickled vegetables and poppadoms. It’s incredibly tasty and a well-balanced meal. The locals swear by it and will happily top up your plate if you are running low! Apple is prevalent on the menu; apple pie or apple crumble for dessert, and porridge with apple for breakfast. The reason for this is the introduction of apple orchards further into the valley. It’s possible to stop for fresh picked apples and order fresh apple juice and individual apple pies prepared and cooked to order. A welcome break along our trekking trail. There are more culinary delights. Mars or Snicker pies are similar to the UK’s deep fried Mars bar, and a popular juice drink as we get closer to Manang appears on the menu. There are orange berries that grow in the are called Seabuckthorn. Seabuckthorn juice is often served with breakfast and has a peach like flavour. The valley walls rise higher, imposing rock reaching thousands of metres above our trail. As we make our way higher into the broadening valley the scenery changes. The valley now has an almost wild west feel, and we pass ranches and goat herds. From here there’s a constant view of the Annapurna range above the valley to the south. Behind us we can see the peak of Manaslu (8156m) and ahead of us to the northwest are the peaks of Chulu (East Peak, West Peak, Far East Peak). We stay the night in Upper Pisang, and are awarded a chance to view the last ceremony before closing at the local Buddhist monastery. Upper Pisang and its monastery sits on the northern slope of the valley, which provides an incredible view to the Annapurnas and their glaciers reaching down towards our valley. With the teahouse’s high balcony it makes for a great opportunity to watch the dawn rise and light up the mountains the following morning. We made our way out of the medieval village, passing walls of prayer wheels and Mani Walls. Mani Walls contain many rock tablets with beautifully carved mantras. 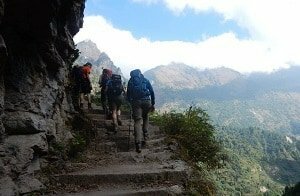 Our trek has provided a gentle acclimatisation and for several days in the afternoon we have short walks to help our bodies adapt to the higher altitude. These provide great opportunities for photos and to take a peaceful moment or two to take in the majestic surroundings. One such place we visit is the glacial lake outside Manang. It’s a perfect spot to watch the sun descend behind the mountains then head back to witness the bold playfulness of large goat herds both outside and inside the town. This is the largest village before the pass and provides comforts such as bakeries with coffees and cinnamon rolls and afternoon showings of popular climbing films. Our trek enters the valley to the north, and we start to climb higher, increasingly surrounded by white capped mountains. As we get closer to Thorung Pedi, passing by the settlement of Yak Kharka and stopping for the night in Ledar, we have some light snow in the evening air. We awoke the next day to blue skies and are warmed as the sun rises above our valley. 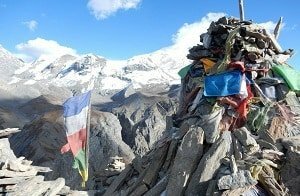 We stopped for a tea break in Thorung Pedi and made the final ascent to High Camp. Our efforts are rewarded, as just above high camp is a vantagepoint that allows outstanding views of the mountains all around us. 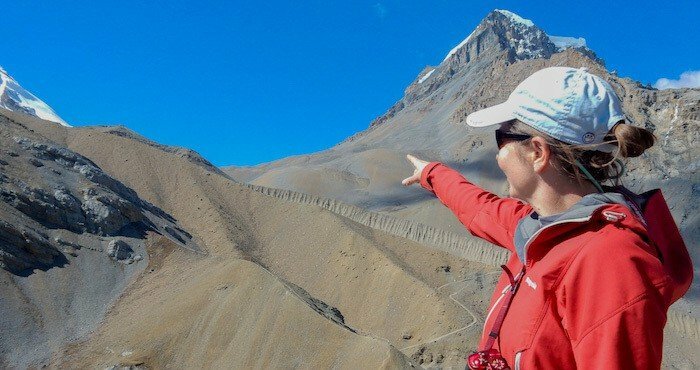 To the south is the Annapurna Range and Gangapurna rising over 7000m, to the East is the Chulu Peaks and to the west is Thorung La Pass, we can make out the route we will take in the night. The day has arrived that has been on all our minds. We set off for the pass at 4am. The night time conditions are perfect, the night sky lit up by countless stars. It’s possible to make out familiar constellations, Orion and The Plough. There is a light band running overhead, the Milky Way, and if you pause to stop and take in the sky it does not take long to witness meteors passing overhead. The land is a moonscape of rocks and contours. Either side of our path are the giant imposing snow-capped mountains looking down on our party. It’s a very surreal, beautiful experience. We have a respite from the night, sipping lemon and ginger tea in a small sheltered tea house before continuing upwards. 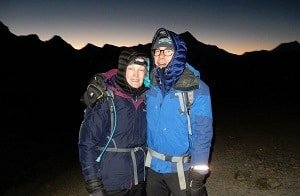 As dawn comes, prayer flags mark our arrival to the top of Thorung La Pass, over 5400 metres in altitude. We are treated to a spectacular view of the valley to the west, to new mountains and plains that we will be crossing on bikes the very next day. We descend down to Muktinath for lunch, to rest and enjoy celebratory beers for our achievements! Three days and nearly 3000 metres of downhill mountain biking! The Lower Mustang outside Muktinath has a dry climate of rocky hills, autumn shades in the fields and forests and outstanding views of the mountains rising above. 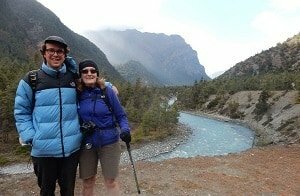 We quickly get used to our new method of travel and speed down to our first stop, Jomsom and join the Gandaki river. The source of this river starts at the Tibetan border and flows south into the Kali Gandaki Gorge, the same route we will take. Outside Jomsom, the river weaves its way through a large, flat plain of rocks evoking a very wild and remote, solitary feel. Quite a contrast to our luxury coffee and apple pie stop in Jomsom. We continue south, along dirt tracks and rocky beaches by the river. It’s definitely an adventure and is quite surreal after crossing the pass the day before. We can look back to see where we travelled from many kilometres away, just a day before. The next night is spent in a candlelit lodge, with log fire and hot showers. Our kind host is a man of many talents, and has recently turned to the international competitive scene of arm wrestling, and was happy to provide training tips and techniques for our group! A good night’s rest leads to our final two days mountain biking by the river, crossing suspension bridges and winding along steep rock cliffs as the valley becomes a deep gorge. As we descend, the upper dry valley turns to fresh alpine style forest then to humid subtropical forest. Staying in Tatopani on our second to last night, we treat our bodies to the nearby thermal hot springs and a beer. We are witness to a stunning view of the mountain Nilgri, perfectly framed by the valley walls and lit up pink in the waning sun. Nothing can stop us now as we descend the final section to Beni. We make it, elated by our journey and travel on to Pohkara, a lakeside city, celebrating with an evening of great food and wine. Amazing effort team!  Want to join us? 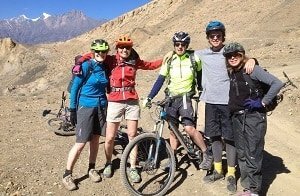 Our next departures for the Annapurna Hike and Bike tour are departing in 2017: 8th April, 7th October, 21st October, 4th November, 18th November.